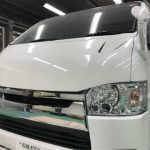 The design concept is speed and hyper form for TOYOTA Hiace 200 series. Our products are aero, seat cover, exhaust system and others. Of cóurse, All of all parts made in Japan.